What is Dr. Craig working on and how does he pick the topics he studies? KEVIN HARRIS: Thanks for stopping by. 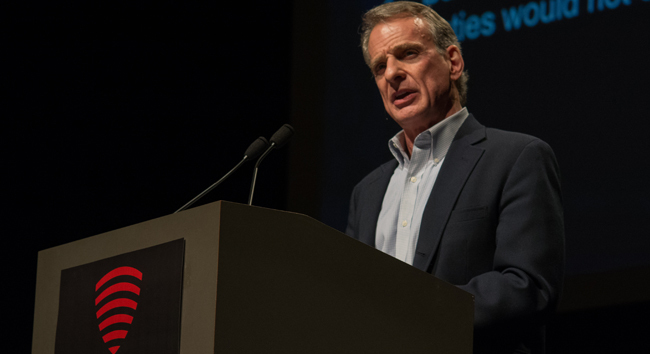 This is The Reasonable Faith Podcast With Dr. William Lane Craig. I’m Kevin Harris. I’m looking at an article here on TheBestSchools.org which lists the fifty most influential living philosophers, and Dr. Craig is one of them. Dr. Craig has been named as one of the fifty most influential living philosophers by TheBestSchools.org, and we’ll talk about this article in an upcoming podcast. So be sure and listen for it. Today we are going to talk about a question that Dr. Craig gets asked quite often, and that is how he picks his topics of research and his next projects. This podcast is very informative. Dr. Craig has recently started work on a biblical and philosophical view of the atonement of Christ. There may be more to the atonement than you realized. Stay close! Dr. Craig, with your book on abstract objects coming out (two books, in fact), it has been a study of yours for a long time. How do you determine what your next course of study is going to be? Your next project or topic? DR. CRAIG: I work on what makes me excited – what I am passionate about. A fellow asked me in Defenders class the other day, “Bill, do you think anybody has ever come to Christ through God and abstract objects?” And I said to him, “No! I am sure they haven't. But that is not why I picked the topic.” I think this is an important issue for Christian theology and philosophy, and as a philosopher I am very interested in it. That was why I did it; not for its evangelistic value. I pick a topic based on what I am really interested and curious about. I've actually taken a hiatus from my study of the divine attributes, which have occupied me since the late 1970s, and I am studying the doctrine of the atonement now because I am aware that the work of Christian philosophers on this has been, I think, very unsatisfactory. Christian philosophers have generally defended very anemic theories of the atonement which are not based upon biblical exegesis but rather upon analogies from human relationships about how we achieve reconciliation with those that we've offended. I think these weak theories are just inadequate to the biblical data. What I am trying to do is to study the atonement with respect to finding a biblically adequate notion of the atonement but one then that is also philosophically coherent because there are a great many philosophical objections to the traditional Reformation doctrine of the atonement which is typically called the penal theory of the atonement. KEVIN HARRIS: Atonement is not a word that we use very often. In fact, I don't think we use it outside of theology very often. DR. CRAIG: No. Not very much. KEVIN HARRIS: So when we are talking about the atonement, I think most of us who are Christians and are trying to grow in our Christian faith, we have a vague idea of what you mean there. DR. CRAIG: “Atonement” basically comes from the words “at one ment.” It is how we become at one with God. That is to say, reconciliation with God. It is all about how we as sinners can be reconciled to a holy God. Atonement is achieved through Christ's death on the cross. It is through Christ's death that somehow God's forgiveness is made available to us. That is the question then – how is it that Christ's dying this tortuous death on a Roman cross should achieve the reconciliation of sinful humanity to God? KEVIN HARRIS: It is a question of not only what was accomplished there by Christ on the cross, but how it is applied? DR. CRAIG: That is an issue, although I am going to try to, for reasons of space and time in the practical sense, restrict it to what was actually accomplished rather than how it is applied to persons who come to faith in Christ. I'm probably not going to be able to entirely avoid the question of application because this does arise for certain theories of the atonement with Christ as our representative and how we are one with him. What I've discovered is that the doctrine just raises a host of issues that impinge upon the doctrine. That would just be one of them. KEVIN HARRIS: You mentioned the penal theory first, meaning punishment? KEVIN HARRIS: That Christ – what? - took our punishment for us? DR. CRAIG: Yes. That Christ took upon himself the punishment for sins that we have committed – the punishment that we deserved. Somehow he bore that himself so that we need no longer be punished but can be recipients of God's grace and forgiveness. KEVIN HARRIS: Is that the most common? Is that the one you think is correct? DR. CRAIG: This is the theory that is the theory of the Protestant Reformers. It is not the view of the atonement of Catholics or of the church fathers. They do affirm this, but they tended to have models of the atonement that emphasized other aspects. One of the things biblically about the doctrine of the atonement is how multifaceted it is. It involves notions of sacrifice, of ransom, of justification, of covenant, and a host of other themes that all come to play in this doctrine. Early church fathers tended to emphasize the ransom view of the atonement – that Christ somehow paid a ransom that frees us from sin and the devil in the same way that someone might pay a ransom to let a kidnapped victim go free. This theory was eclipsed by Anselm's satisfaction theory of the atonement – the same Anselm who developed the ontological argument for God's existence. Anselm argued that the ransom theory is inadequate because it is directed in a sense towards Satan. It is paying a ransom to Satan to let us go free when an omnipotent God could have just freed us from his own power – he didn't need to pay a ransom to anyone. He said the reason Christ had to die is because sinners had offended the honor of God by disobedience and sin. We had besmirched his name and brought dishonor upon God and therefore owed God some sort of satisfaction for this dishonor we've brought upon his name. None of us was able to pay that satisfaction because we are all fallen sinners who are guilty of having dishonored God. Only a perfect man – a God-man, Jesus Christ – could offer his life to God as a sufficient satisfaction for the dishonor that we've done to God. Anselm's model of the atonement, I think, would really resonate in first century Jewish culture because that was an honor-shame culture. As you read many passages in the Old Testament, it will emphasize the dishonor that Israel through its sin has brought upon Yahweh's name and how this dishonor that has been done to God must be rectified. Although critics of Anselm's theory will try to write it off as reflecting the feudal medieval culture that Anselm lived in, it actually connects very closely with the ancient near East and the honor-shame culture in which they lived. Now the Reformers went further than Anselm. They said it is not simply God's honor that has been abused; rather, it is God's justice and holiness that have been violated by our sin. We have been disobedient to God's moral law and are sinners and therefore condemned by God. It is not so much God's honor as God's justice that must be satisfied. Again, this model really connects closely with the Old and New Testament which strongly emphasized God's wrath upon sin and the need to propitiate, or satisfy, God's wrath which is an expression of his holiness and his wrath upon sin and evil. This model also, I think, does capture an important part of biblical teaching. The justice of God needs to be satisfied. Again, the emphasis would be that none of us is in a position to do that because we are all part of the problem. We are the law-breakers. We need Christ to pay the punishment for sin that we deserve and thereby satisfy God's justice. KEVIN HARRIS: It seems like we combine a few. DR. CRAIG: Yes! Oh, certainly! DR. CRAIG: Absolutely. In Colossians, this is exactly what Paul does. He talks about Christ dying for our sins, and thereby achieving victory over the evil powers that stood against us. He triumphs over them in the cross by setting aside this legal bond of the law that stood against us, condemning us. These are certainly related. The idea of Christ's victory over sin and death and hell can be achieved precisely through his substitutionary death. KEVIN HARRIS: We've looked at the penal, ransom, and satisfaction theories. DR. CRAIG: Those are some of the historical models of the atonement – some of the principal ones that have been offered. Then there is the whole biblical question – what does the Bible teach about Christ's death? Here it seems to me that the central theme of the New Testament with respect to the death of Christ is the theme of sacrifice. Christ's death is a sacrificial offering on the pattern of the Old Testament offerings of animals in the temple for sin, especially the Yom Kippur offering where once a year the high priest offered a lamb or goat for the sins of the people. A goat was driven out into the wilderness bearing the sins of the people to show that these have been removed from the people. Also the Passover sacrifice – though not an offering for sin – was an offering such that the blood of the Passover lamb shielded the people from the avenging wrath of God that fell upon the Egyptians – the Egyptian first-born in Egypt. The Passover remembers that. Where the blood of the lamb was on the door posts it protected them from the avenging angel of God that brought death to the first-born of Egypt. The Passover sacrifice was not a sacrifice for sin like the Yom Kippur offering, but it was like a storm cellar that protected them from the tornado of God's wrath as it swept through Egypt. When Jesus celebrates the Last Supper – when does he do so? He does it at Passover. He establishes a new covenant in his blood. He says, “This is the new covenant in my blood.” That evokes the same language that Moses used in Leviticus in establishing these Levitical sacrifices for sin and guilt which suggests that Jesus himself saw his own impending death in terms of a sacrificial offering to God that would satisfy the wrath of God and shield those who place their faith in him from God's avenging wrath and justice. KEVIN HARRIS: Here's an atonement theory I haven't heard of – the moral influence theory. DR. CRAIG: Ah! I forgot to mention that probably because it is so rejected by orthodox theologians. Abelard during the Middle Ages propounded a theory in which the way in which Christ achieves atonement for sin is he provides us a kind of moral example of selfless sacrificial love by dying on the cross. This inspires us then to lead similarly good lives and to repent of our sins and come back to God and to be reconciled to God. On the moral influence view in a sense God doesn't need to be satisfied at all. It is we who need to be changed and to come back to God. In a sense, on the moral influence view nothing really is accomplished at the cross – nothing really happens there. It is just that we are inspired by Christ's example to be reconciled to God and turn from our sins and come to him. I think this theory, though it has elements of truth, is really quite inadequate as a theory of the atonement because why in the world would God send his Son to die this tortuous death as a demonstration of love? P. T. Forsyth is a classical author on the atonement and he said, I can understand where you would see it as a demonstration of love if I threw myself into the river to rescue a drowning victim and pull him to safety. If there were no one drowning and I just threw myself in the river and say, “See how much I love you?” and drown, how would that inspire in me love to admire your sacrifice? It would seem crazy. I think Forsyth was quite right. The power of Christ as a moral example is precisely because he gives himself as a sacrificial offering and therefore can inspire us and our lives. But apart from dying for sinners to save sinners, he is like that person who just throws himself into the river when there is nobody to be saved. KEVIN HARRIS: Have you noticed that all of these that we use – these descriptions of the atonement – historically and even today are all kind of metaphors, aren’t they? DR. CRAIG: Yes, I think that is fair to say that these are metaphors, certainly like ransom is a metaphor. KEVIN HARRIS: Paying the price, writing the check that we couldn’t write. DR. CRAIG: Right, yeah, that’s a metaphor. Whether the idea of sacrifice is a metaphor – that is less clear to me. Christ's offering himself as a sacrificial offering to God – that seems pretty literal to me. But I don’t have an objection of the language of metaphor so long as we can recognize that metaphors tell the truth. To say something is metaphorical is not to say that it is untrue. If I say, “She really has a bee in her bonnet,” that is true! That is a way of saying she is really angry or upset. Just because it is metaphorical doesn’t mean that it is not true. These metaphors in Scripture communicate truths about the way in which Christ’s death atones for sin. KEVIN HARRIS: Illustrations. But all of these you can see a common thread. They may different in some of the nuances. Isn’t there one common thread that Jesus is . . .
DR. CRAIG: Christ is the common thread, yes. Christ's death somehow atones for sin. But then in terms of providing an account of how it does so, they are as different as night and day. In assessing these theories, you get into all sorts of subtle and interesting distinctions. For example, did Christ die as our substitute or did he die as our representative? They sound the same, but they are actually different if you think about them. For example, a good example of a substitute who is not a representative would be a pinch-hitter in a baseball game. He comes in and bats in the place of someone else. He is substituted into the lineup. But in no way does he represent that other batter. If he gets a hit, it doesn’t help the other man’s average. If he gets an out, that doesn’t effect the other man’s statistics. He is a substitute for that person, but he is not a representative. By contrast, there are cases where you have someone who is a representative of you. Someone who is a spokesman. He speaks for you. For example, in Congress we elect people who are representatives. But it is not clear that they are substitutes for us. Sometimes you can have representatives who are substitutes. I think a good example would be someone who is a proxy at a stockholder’s meeting. If you own stock you sign a form that says this person can vote in my place. He represents your interests. But he also substitutes for you. He votes in your place. The question will be: in dying for sinners, is Christ a substitute for us or is he our representative, or is he both? These are the kinds of subtle issues. KEVIN HARRIS: When you read the Scripture that Christ is our advocate – like he is our lawyer. DR. CRAIG: Yes, that is right. That is an example drawn from the law court. KEVIN HARRIS: I hear stories like the judge pronounces sentence on someone and it ends up being his Son. And then he takes off his robe, comes down, and takes on the penalty. DR. CRAIG: Those illustrations have come in for a lot of criticism by theologians who write on the atonement because they simply cannot capture the full doctrine of the atonement. It is rather like people trying to give analogies for the Trinity. DR. CRAIG: In the end, these analogies all fail. In the same way these illustrations cannot capture fully the doctrine of the atonement. But nevertheless I think these illustrations are helpful in that they can capture aspects of the atonement and thereby make it helpful. KEVIN HARRIS: Can we continue to maybe work on our illustrations? We use the same ones over and over. DR. CRAIG: I think what we need to make very clear when we appeal to an illustration is what aspect of the atonement this is meant to capture and to make it clear that we are not suggesting that this is just like the atonement. Because in the end, like these analogies for the Trinity, they are ultimately going to fail. One of the most interesting things, I might add, that I’ve been doing – not only have I been reading heavily in biblical exegesis (which is very interesting and controverted) but I’ve been reading legal philosophy as well because this comes into play. What is punishment? What is the definition of punishment? When is punishment justified? I have encountered such interesting theories of retributive justice versus restorative justice and how this is to be applied to God’s justice. Is it retributive? Is he giving the sinner his just desserts? If so then how does this retributive justice fall on Christ who is innocent? How can he be the subject of retributive justice against my sins? Then it gets into the nature of punishment. Is punishment the subjective burden born by the person who is sentenced, or is it an objective penalty that is placed on the person which may be subjectively very differently received by persons? For the hardened criminal, five years in jail may be nothing, but for someone who is sick, say, or mentally ill or frail, that could be absolutely devastating. This gets into interesting issues about punishment. There is just a whole array of these kinds of legal and exegetical and philosophical questions that arise in this doctrine of the atonement. KEVIN HARRIS: The two apologetics issues that come up on the atonement over and over that I see are 1) Jesus was only dead three days, so that is not much of a sacrifice. The other one is 2) how can human sacrifice in any way shape or form be applauded or celebrated in any way? Those are the two right there. DR. CRAIG: Both of these questions, I have addressed in recent questions of the week on the website. While these are not final answers (as I say, this is an exploratory study), I do offer some thoughts there with respect to both of those objections that I think our listeners will find very interesting. KEVIN HARRIS: Very good. All of this work on the atonement will address this as well? KEVIN HARRIS: Bill, I can see why this is an exciting area of study. DR. CRAIG: I am pumped! See http://www.thebestschools.org/features/most-influential-living-philosophers/ (accessed September 5, 2016). For example, see http://www.reasonablefaith.org/what-did-jesus-suffer (accessed September 5, 2016).